Delete a document folder only if you are sure that you no longer need any of the documents within it. Move any documents that you want to save. Even if you have the Document Admin permission, you cannot delete a document folder unless you specifically have the delete permission. 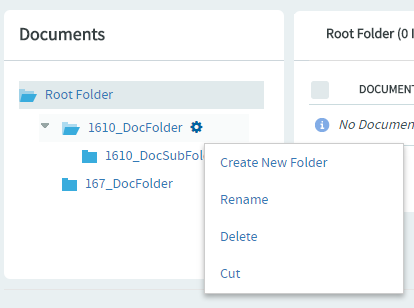 Using the document tree, find and hover your mouse over the folder you want to delete. Attention: If the folder contains one or more documents that you do not have permission to delete, you cannot delete the folder.